The opening meeting of the Crewsaver-sponsored Laser 2000 and Laser 3000 Millennium Series for 2003 was held over the weekend 26-27 April at Queen Mary reservoir in West London. Following a presentation on tuning tips from Skip Atkins, the series champion of the last two years, a total of 22 Laser 2000s and two Laser 3000s joined the first race, which started in light fickle winds on a windward/leeward course. It was Skip and regular contender Paul Williams who led the way around the first mark almost together. But on the first downwind leg Paul found a hole in the wind which Skip and Zoe managed to sail through. Paul finally emerged in 15 position before fighting his way back through the fleet to finish ninth. The racing was tight but it was Skip and Zoe (Stone SC) who led home in front of Graham and Mattie Ponsford (Chichester YC) and Trevor and Caroline Bradley (Littleton SC). After a quick lunch the fleet returned with a new player on the circuit offering battle near the front. Andrew and Anne Rodwell (RAFSA) had missed the first race due to a rigging problem on the new boat but fought their way through the fleet and chased Skip and Zoe all the way to the line with David and Juliet Brecknell (Chichester YC) third. The second race had been sailed on a sausage/triangle course, but the race officer returned to the windward leeward course for remaining races. The third race was held in freshening winds with the fleet gathering confidence and all arriving together on the start line. However, it was towards the end of the race when a sudden gust caught a group of four boats out near the leeward mark and gave the clubhouse a tremendous spectacle of synchronized capsizing. The third race finished with Skip and Zoe being chased by Andrew and Anne who had taken most of the race to pass Trevor and Caroline. Saturday evening saw many of the competitors gathering in the clubhouse for more tips and hints leading into a question and answer session chaired by Skip. This was followed by a well attended social gathering for food and refreshments. Sunday finally saw the weather which had been predicted all week with winds constantly over 20 knots, this reduced the fleet to just nine boats of which four were fully reefed. The course was set close to the south wall to offer some respite from the chop in front of the clubhouse. An unusual capsize from Skip and Zoe allowed Andrew and Anne through and the chase was reversed. With Caroline recovering from a sailing injury suffered the previous weekend, Trevor and Caroline had taken the precaution of sailing fully reefed but still managed third place hotly pursued by Ian and Andrew Craig (Queen Mary SC). At 15 years of age Ian is the first Junior/Youth helm to appear on the circuit and was competing at the front in formidable conditions. 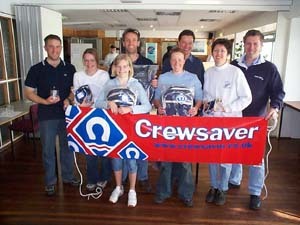 The fifth race saw Skip and Zoe again leading Andrew and Anne with Trevor and Caroline in third place. The sixth and final race saw four boats on the start line with Andrew and Anne leading Ian and Andrew to the finish in a race that saw some of the fastest sailing of the weekend.